Spending time with our sweet daughter, Leah. The flowers (thanks, STWM and Henry) are much prettier than the laundry mountain, don’t you think? 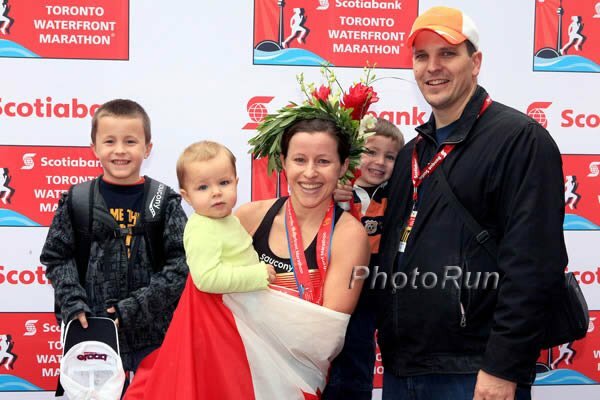 Proud to be “Canada’s Marathon Mom”. Thrilled when Alan told me that fellow Marathon Mom and friend, Mary Davies won the race! My hip was bruised for a few days after the race but is getting better. Got it x-rayed to make sure it’s ok. I can’t believe how much my gluteus maximus has changed since I played hockey! Because my maiden name was Lehrbass, the girls used to call me ” Lard – – – “. Not much lard left anymore! 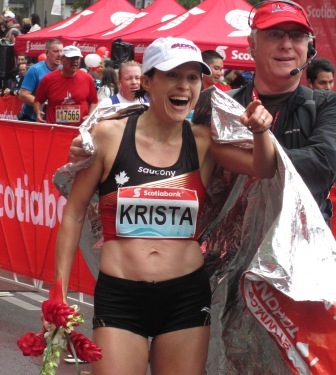 Well, it’s been 5 days since my “gutsy” 2:32:15, 4th overall, 1st Canadian finish at the Scotiabank Toronto Waterfront Marathon. Life is grand and God is good. I don’t think I’ve had a as-soon-as-my-head-hits-the-pillow instant sleep yet but it will come. The few days after the marathon certainly have a lot of buzz. The media interviews, messages from family and friends, pictures, reports (I’m still thrilled with Mary Davies’ win and honoured that I was of help to her), race coverage, and general talk about the race certainly make it exciting, and easier to come down from your high. And because you’re not rushing out the door to get in the km’s, you have more time to reflect, appreciate, analyze, and summarize your training and racing experience. I’ll talk more about this later. So, what did Marathon Mom do in the week after the big race? Well, I CERTAINLY enjoyed eating the foods I avoided (or limited) during my build: brownies, coffee cake, chocolate chip cookies, tuxedo chocolate cream cheese cake, dark chocolate, apple crisp, cereal, and turkey dinner leftovers…to name a few! I had a few lunches of simply coffee and sweets, and my vegetable consumption has been very low! I’ve been listening to my body and I can already tell that the novelty will wear off and I will want to go back to my healthier way of eating! But not quite yet! 1) Removing the soother from baby Leah (ok, she’s 19 mos but still our baby). She only had it at bed and just like her brothers, she picked out her own new back pack, which I filled with toys/books/buddies for bed, instead of giving her the soother. It worked perfectly! A few times she cried and was up for a bit in the night but was able to fall back asleep, no problem. The funny thing is that we know but she doesn’t know why she’s been a bit off (the benefit to taking it away at 1.5 yrs, and not later). We have not mentioned the “S” word and if it comes up, I’ll simply tell her it’s for her baby dollies. The first nap was really cute, hearing her through the monitor say, “Back Pack” over and over. 2) Taking, Seth, our 4 year old back to hockey and the parent-tot skate. Based on how well our 6 year old is doing with hockey, we know being on the ice twice per week will be very beneficial. Seth was quite pleased to go without big brother. It means that I have to get Leah down for her nap early in order to go but it’s worth it. We’re even considering getting the skates out for “baby” Leah (we had the boys on skates at this age, which was really easy when we had a backyard rink). 3) Spending more quality time with Leah, reading books, singing songs, etc. Kids grow so fast when they are young. Gotta treasure it. 4) Going for coffee and doing a bit of shopping with a friend. Britanie and I had a lovely morning. Long overdue but well worth the wait. 5) Taking the kids for eye appointments, visiting with family who was in town for the afternoon, volunteering with the kids’ school nutrition program (preparing the snack and buying some groceries), getting “Grandma” Margaret to and from the kids’ Special People day at school, and the usual household chores (LAUNDRY, cleaning, dishes, school tasks, etc.). 6) Spending more quality time with Jonathan. I think he’s enjoyed seeing me more in the evening since I’m not going to bed as early. Sleeping in until 6:30-7:00 a.m. has been nice too (funnily enough, though, I often wake up at 5-5:30 out of habit)! a) I must get bottles that are easy to see and carry in order to properly hydrate/take in carbs (I missed the first 3 stations during the race and didn’t drink enough when I did get my bottles – that darn humidity tricks you in rainy weather). Even the dietitian who has done 9 marathons is still learning. I remember watching Mary do as I had likely recommended; running longer with the bottle in order to take in small sips and finish it entirely. Next time! b) We are going to implement longer and harder weekly tempo runs, and ensure long runs with execution components are completed as planned (Rick will likely bike beside me for these key runs in our next build). c) We will continue to increase the overall mileage and intensity of workouts as my body has successfully handled this with each marathon. We’re planning 170-175 km/wk. We’ve set the bar high again with goal race times and yes, we’re going after that Canadian record at Worlds (Aug 2013). But this time, we’ll train to be well within reach since we believe my performance at STWM was better than a 2:32 (based on weather and looking at the slow times of the other elite athletes). d) We will keep doing what is working (sleep, rest and recovery, chiro/massage, nutrition, cross training) while focusing on our 4 year plan. Because of my hip (it bruised after Sunday), we decided it would be best to get an x-ray to rule out anything major. We (massage therapist, chiropractor, Rick and I) are pretty sure it’s muscular but would rather be safe than sorry. It’s getting better every day but definitely requires complete healing as do the other parts of my body! This marathon was certainly one of my most difficult, physically (but not mentally as this seems to be getting easier with experience). I’ll likely get back to some swimming and biking next week. If I’m named to Team Canada, Japan (Chiba Ekiden relay, November 23) is still the next race as planned. And December will be a month of simply staying in decent shape with more cross training than running, and no racing. Tomorrow should be a great day. After our usual weekend waffle breakfast, Jonathan is going to help a cousin move while I help at our church’s community breakfast and take our eldest to hockey. We’ll likely rake some leaves in the afternoon, have some quiet time (the boys watch tv while Jonathan, Leah and I nap…it’s lovely!) then go out for dinner to celebrate the boys’ great report cards, Jonathan’s job, my race, and Leah’s desire to do her business on the potty (haven’t quite succeeded but she asks and tries). Thank you so much for your wonderful messages. I am truly honoured to be an inspiration for many of you. Loving this life God’s given me. P.S. If you are interested, I am now on Twitter (@kristaduchene). Rather than creating a new Facebook page, I’ll keep this blog and twitter up to date. Thanks again.